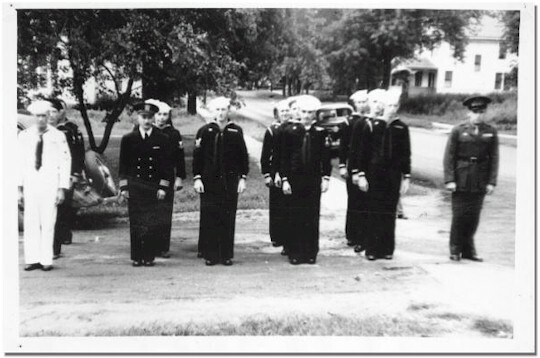 This group of Navy men is assembled in Arenzville on the occasion of a parade. Ken Kolberer suggests the following possible names of men in the photo: Front row, third from left Fred Ore; fourth from left Earl Niestradt; far right standing alone, Clifford Thomas. Second row, second from left Chester Lutkehus. Far right back row Wayne Kolberer. Can anyone recall the date or the identities of any of the other men? 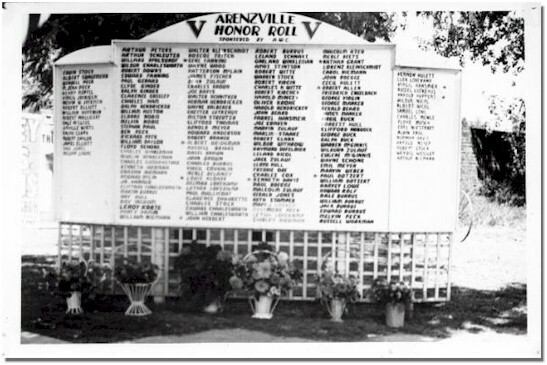 The Arenzville Honor Roll, a list of those from our community who have given service to their country's armed forces. This first wooden panel was later preserved in the Legion Hall, and then replaced with a black granite monument next to the Hall. Copyright 2002, Molly Daniel. This page last updated 12/20/2003.